We're at a nice point of the summer, yes? School is out, the 4th of July is on the horizon, and everything is feeling pretty laid back at work. So, what's going on with me this week, you ask? Lots of summery activities. Reading, dancing, writing, and only one thing made me cry this week. ;-) What's this all about? Read on! I won't keep you in suspense. The teary thing is that we received a letter confirming Anne's placement in our district's universal Pre-K program, with her school assignment, start date and time, and supply list. It made me a little...*emotional*, as such things are wont to do. She's my baby, and dropping her off for the first day in September is going to be a bit rough. You might want to consider skipping the inevitable hysterical weepy post that is coming for *that* particular day. Thus, I've been trying to distract myself from thinking about this coming fall with other things. What are those, you ask? Read on! -2- Distraction #1 - "Maybe if I try moving it a little closer to my neck...OW!" So, I've been dancing. :) Practicing for the festivals, and I decided to go with balancing rather than drum. I just wasn't feeling the drum. If I'm bored by my own dancing, I hardly think anybody is going to want to watch me. So I pulled out my old buddy, my sword. Sword and I go way back. :) We like each other, we usually dance well together. Occasionally he gives me a heart-stopping moment during performances when I go to balance him on my head, but for the most part he is predictable and stable. I want to add shoulder balancing to my repertoire, so Sword and I have been practicing a bit. It's going well, albeit a bit ouchy. But I'm excited to be feeling good about the music and style that I chose, and it's invigorating to have a new challenge to work on. If you haven't watched already, my past two video posts (Tea Time episodes 4 and 5) encompass a short series of my journey in Middle Eastern dance. I had a lot of fun recording them, and I manage to tie everything into a Catholic angle with accompanying patron saints. :0 Go check them out and leave me your thoughts! -4- Distraction #2 - "Mom, why do all the books you read have people wearing bonnets on the cover?" I'm currently on the third book, and because the characters all carry over from story to story, I am very heavily invested in the characters. 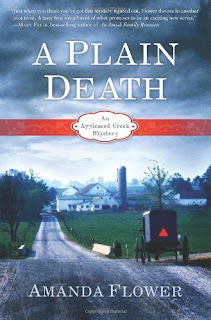 The titles often go on discounted prices for Kindle, so keep an eye on them, or see if your library has them. I definitely recommend. I'm on chapter three. I've been keeping pace with the weekly chapter posts, but this week the chapter is longer and I haven't finished yet. :0 But I'm trying! It's nice to have a longer span to read a deeper spiritual book such as this one. 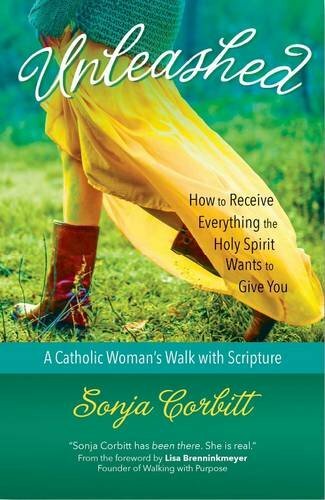 I've been leaving comments after each post over at Catholic Mom, and there is lots of chatter each week. Come join in! -6- Distraction #3 - "I need a better word here than 'flexible.' Resilient? Maybe. Let me check the Thesaurus...Buoyant or supple? Um, no." The EXCITING news! I've been doing a lot of writing lately. Other, non-blog writing. Well, to be precise, I took several old pieces that did appear at one time on this blog, and completely re-worked and edited them. And the reason that I did that is because those pieces are going to be posted somewhere else, and I thought the writing style could use a boost and an update, and to incorporate less emoticons. ;-) Where are these pieces going to appear, you ask? Read on! -7- There is a theme, right? I'm a new contributor at Catholic Mom! I am VERY EXCITED. :0 I'm going to be contributing one article a month over there, and I even have my own little author page and everything, soon to collect my writing as it appears. My first piece will come out the week of July 13th, and I will be sure and link to it from here if you'd like to read! I truly appreciate your support! On that vein, I've been getting more comments and interaction over here on this humble blog, and I wanted to take an opportunity to say thank you to you all. Knowing that people read what I write, and care enough to respond to me, well...that's why I do this. I do love to write, but I don't think I'd continue if I didn't have anyone to share it with. And for that...THANK YOU. So much. I'll talk to you all next week. 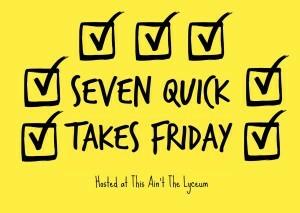 But in the mean time, check other 7 Quick Takes over at This Ain't the Lyceum! AWWW, your baby is going to school. So sorry that makes you teary-eyed. I can sort of relate, as my little fellow is starting to noticeably lose his baby chub as he enters older-toddler-hood. I don't know why that just gets me, but it does. I don't have much time to read, but your book selections sound interesting, and a few I have allocated to my Amazon wish list for "someday." And congratulations on branching out your authorship! Amy! Always nice to see you. :) Oh, oh, those toddlers cheeks are SO PRECIOUS. Yeah, it's hard when they grow in some ways. I know she's excited about school, and she's ready, but it's such a milestone that it makes me emotional. With regards to dancing, this is one of the things I adore about Middle Eastern dance. Women dance pretty much as long as they want to. I love ballet and all, but you're "over the hill" by age 35, and that's just not a sustainable model. ;-) So, yes, hope for all us to shimmy well into our 80's! I do this too with my Amazon list. I keep a private shopping list of titles, and when I want something new to read, I browse on there. Plus, Amazon always bolds the price if it's decreased, so you can see right away if something is on sale, so that you can snap it up.